Tucked into lots of blankets, cuddling with my doggo, and casually reading a new book is the literal definition of a perfect hour spent for me. For years, I had been sleeping on hand-me-down mattresses. I figured, they were so expensive, it wasn’t worth any sort of investment. I mean, it’s only where I sleep at night, right? But then I started getting horrid back pains and was tired every morning, no matter how early I went to bed. I swear, I tried a million different things. New sleeping positions, different sleeping medicines, weird sleepy time meditations that really just made me giggle, hiding my phone under a rock a million feet away, etc. But then I got a Big Fig Mattress. When Big Fig first reached out, I was a little hesitant. I’d had the same mattress for a few years, passed down from a friend, and it was squishy, cuddly, and decently sized. I had bought a bed frame from Ikea for it. I wasn’t sure I wanted to pass it on. But when Big Fig mentioned their white glove service that included complete set up of a new bed frame and removal of my old mattress, I knew I had to try it. In case you haven’t seen Big Fig everywhere in the plus size space, Big Fig Mattresses are specially designed mattresses for a bigger figure. They tout that every design feature is made with plus sized figures in mind, especially plus sized couples. From super support foam foam built into the edges, speciality designs to avoid sagging, a custom frame built to supported over 2,000 lbs and even fancy cooling gel, this beast is MADE to avoid any sort of chubby sleep struggles. So I ordered a massive king size mattress (go big or go home, right?) and waited for that white glove delivery. I wanted to make sure that I was giving y’all the best review possible, so this review was written after having the mattress for almost 90 days. I absolutely want to give you the most honest review possible, and Big Fig encouraged that. What I love about my Big Fig. So I had read that this mattress was rather firm, which was the complete opposite of my old mattress, so I was concerned. But let me tell you, within two nights sleep, my back pains were GONE. I seriously haven’t had any sort of sleep-based back pain since that second day. In fact, there hasn’t been any sort of waking-up-on-the-wrong-side-of-the-bed pain at all. Another one of my favorite features is the ThermoGel cooling technology. When I first read this, I didn’t believe it. I tend to be a sweaty sleeper, and I thought there was NO way. This was just hype and fancy words. Lo and behold, my night sweats didn’t happen when I got this mattress. I was so confused. I had never been able to stop those?! I will say, when I put a mattress protector over it, you can’t really feel the impact as much. But if you are cover free, expect cool nights in the best way possible. One thing this bed doesn’t really tout, but it has been a HUGE plus is the lack of motion transfer. Both my partner and I have a tendency to toss and turn. When we’re sharing this bed, I can’t feel their movement at all and vice versa. The firmness of this foam seriously allows some major movement without waking anyone else up. This is probably my favorite unspoken feature! What I don’t love about my Big Fig. Okay, nothing is perfect- though this mattress is pretty close. But I do need to add some of the cons here. First of all, this thing is a BEAST. Yes, I got a king sized one, but if you’re big and tall like me, you sort of need to go in that direction. And this thing is MASSIVE, not only in size but in weight. Next time I move, this will be no joke. So keep that in mind if you move a lot; you will need movers for sure unless you are strong as hell (which I am NOT lol). This also ties into the size, but because it is so heavy and built to support a lot of weight, you probably want to use the bed frame they offer. There’s no way my Ikea bed frame would have survived my Big Fig. At first I was upset about this, because I liked all my under-bed storage, but I’m adjusting to the minimal frame and the fun of being able to pick and choose my headboard. This mattress is pretty firm, especially if you are not plus sized. I wasn’t sold on a firm mattress at first, and thought I’m now a true believer and will never go back, this could be hard if the person you share a bed with isn’t bigger as well. I had a bunch of my friends try it out, and one or two of the much smaller ones couldn’t handle how firm it was. So make sure if you are sharing this with a straight sized partner, they are a fan of the firm. My partner isn’t plus sized, but they like a firmer mattress, so there haven’t been any issues. Overall, I love my Big Fig Mattress. This mattress has changed my sleeping 110% and I am so incredibly happy about it! If you are plus sized, RUN not walk to the Big Fig website and order it. You are worth the investment, I promise. A mattress isn’t something you should pick up off the side of the road. You spend so much of your life sleeping, cuddling, and other fun things in bed, why would you cheap out? Do your body a favor, and make sure you get white glove service while you’re at it. 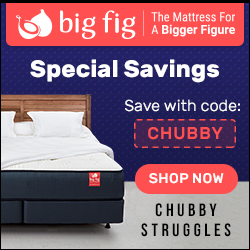 Save big on your very own Big Fig Mattress by using the code CHUBBY.